Food Blogga: What is a Cherimoya? Perhaps the Greatest Fruit on the Planet. What is a Cherimoya? Perhaps the Greatest Fruit on the Planet. The cherimoya (pronounced chair-uh-MOY-yuh) is the king of fruit. This is no surprise given that this ancient Incan fruit was originally reserved for royalty. From external appearances, the cherimoya isn't exactly captivating. It looks more like something out of The Flintstones rather than an exquisite fruit. Don't let its pre-historic appearance put you off. 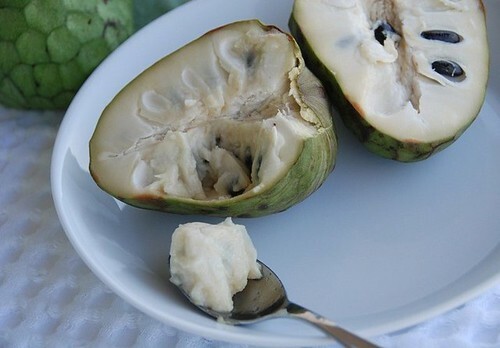 Slice open a cherimoya and you will discover a fragrant, ivory, custard-like flesh, hence its common name "custard apple." Once ripe, cherimoyas can be refrigerated for 1-2 days, but they will lose their flavor if kept longer. 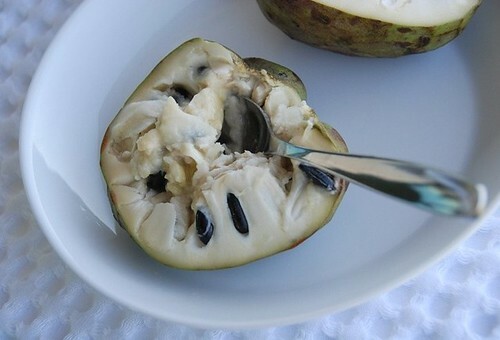 They are best eaten as soon as they reach full ripeness; their flavor is most intense when eaten at room temperature or just slightly chilled. What does a cherimoya taste like? 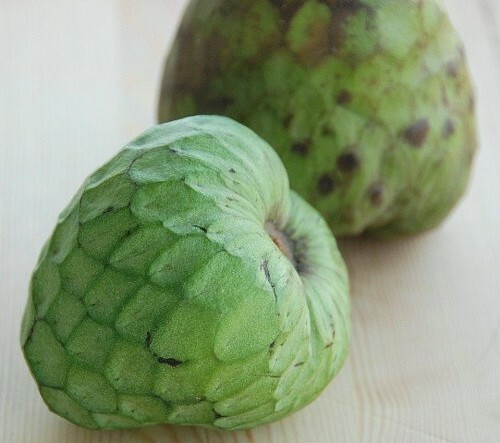 A perfectly ripe cherimoya is an intoxicating combination of tropical flavors like bananas, coconut, strawberries, and mangoes. Some people also taste pineapple and papayas. Don't think one fruit could possibly have all of those ambrosial flavors? Then try one to see for yourself. Slice the fruit in half, and using a spoon, scoop out the flesh. You could sprinkle it first with fresh lime juice; you could add the flesh to a smoothie; you could even make sherbet with it. But don't. It's best unadulterated, when you can truly appreciate its unique flavor and texture. Just be sure you don't eat the shiny, large black seeds inside. Chomping on those will just send you to the dentist's office. Once you taste a cherimoya's luscious, creamy flesh, you'll understand why Mark Twain called it "the most delicious fruit known to man." Where can you buy cherimoyas? Most U.S. cherimoyas are grown in CA and are available from early January through April. However, since they're sensitive to temperature changes, the season varies from year to year. Few major supermarkets will likely carry cherimoyas; try specialty and organic markets, or go online to reputatble sites such as Melissas.com. Though they're pricey, they're worth every penny. I'm jumping up and down with joy at this very moment. Custard apple was a hot favorite during my childhood in India and I simply had no idea I could get it here. Thank you thank you thank you! and Thank you. If you have the patience to deseed it, you could try an Indian sweet called Custard Apple Rabri. Milk thickened to a paste consistency, with slivers of custard apple, flavored with cardammom and saffron. Heaven in a bowl. I love this fruit which tastes like mix of banana, strawberry and pear.. Thank you for this free education on exotic fruits I would certainly never have discovered myself! :) I will try and hunt these down and distinguish its distinct flavors myself. Oh Susan, this fruit is delicious. I grew up with this fruit. Back then I didn't care much about it, but now? I miss all of them. Wait until you see fruit called "langsat" popping in CA, you'll probably going to like it too. Thanks for sharing and introducing this exotic fruit to us. Quite interesting.. I've heard of this fruit but have never seen it or known about its wonderful flavors. Thanks for sharing. Will have to discover for myself sometime soon! We ate these a lot when I was growing up in Spain. I love them! Custard apples are very popular in India, but the appearance is slightly different. Custard apple known as sitaphal is also used to make many desserts and sitaphal icecream is a rage in Mumbai, when they are in season. Wow! Never heard of these. I'm going to look up nutritional info because now my interest in piqued! Wow, I've never heard of this, but it sounds like it tastes like tropical goodness. And that makes me reallyyy want to try it ASAP! Need to find it! Ooh Custard apple ...thats what they are called in India. Very popular there. As always...great post Susan ! you always find the coolest fruit! this one sounds amazing!! apple custard?! i'm sold!! What a fantastic fruit that is! Never heard of or saw one before. Isn't it amazing how fruit looks sometimes, this one like a rolled up lizzard skin and that custardy-texture inside. Lovely and when I hear you discribe the flavours....wow! If ever I ran into one here... I know that I'll have to buy one immediately!! I lurv custard apples!! Great post. wow, I've never had one of these! Now I'm curious! Count me in...I must find it and try it. I'm a big fan of simply eating fruits as dessert. 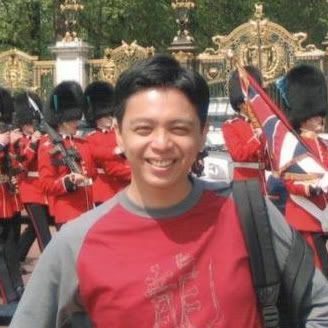 Sigh, they're everywhere in the Phils but I always took 'em for granted. 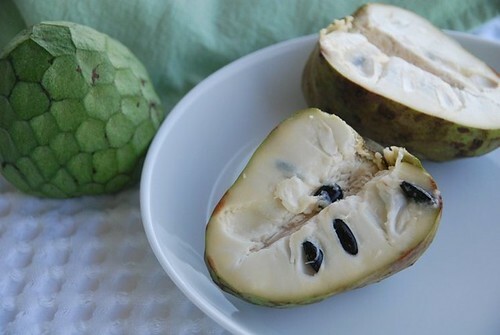 We have an ice cream manufacturer that makes cherimoya ("Atis") ice cream! Love custard apples (that's what we call them here). They make lovely ice-cream and milkshakes. Sounds amazing!! I'll keep an eye out for it, and many thanks for all of this tasty info. I've not seen these up here in No. Cal. but I've tasted them before and they are everything you say they are. I'll have to keep my eyes open for them. Beautiful photos, Susan. They look similar to the custard apple that we get in India.Is this the same???? I absolutely need to give this another try. In my taste memory, I think I have cherimoyas in the same "don't go there" compartment with durian. Every time I stop by your blog I learn something new. I am also totally amazed at your knowledge and wonderful way of explaining things. Seen these Susan but have never tried them. I am a tropical fruit fiend. Sounds like it's worth a go-thanks for the post! I love love looooooooooove cherimoyas but can't get them unless I'm in the city. They're SO good! Now that is a new one to me. And I don't think I've ever seen one around here, but I'm going to look. It sounds like something good to give Cash when he's old enough - the texture looks awesome! It must be the best as everybody who has tried this fruit sound so enthusiastic. Thanks for introducing us to it. chris-I hope you find some. elra-I don't think I have seen langsat yet. Now I'm excited! lori-You can find them here in SD pretty easily. rita-I appreciate that. Thank you. snooky-It does taste like the tropics, indeed. anushruti-Sitaphal ice cream must be heavenly. shn-If not locally, then you can definitely get some online! wanm-You will really love it too. indian's blog-Thank you so much! I had no idea they were so popular in India. lien-It is lizzardy looking, isn't it? lyb-Keep looking! They're worth the wait. christine-Maybe in SF? Good luck! annie-I'm so happy to hear that. Thank you, kindly. marc-Really? Well, you'll have to get some next time you're in SD. gretchennoelle-They sure are! Guanabana? Hmm...not sure I've seen those. Will have to look though! Ah! I ate one of these a long time ago after seeing one in a supermarket. Wasn't all that impressed at the time but I guess I could re-visit it! Bow that you've brought them to my attention I will be watching out for them everywhere. Their design even reminds me of ancient Inca dress. What a nice combination of tropical flavors in one fruit. Very interesting stuff. I love custard apples, in fact we've been lucky to have them for very long this season. The ones we get here are deeper ridges, so first when I saw your photo I thought it might be a fruit from the same family. It most definitely wins a spot as one of my top three fav fruits! I love custard apples! Here in the UK you rarely see them but when you do, you must pounce! You should be patient and wait until it's fully ripe because it tastes so much sweeter and juicier. finally some pictures that do the cherimoya justice. I'm finally inspired to buy a tree. thanks. warrington-So glad to hear it! And thanks. Cherimoyas aren't the most photogenic of fruits. We have been here on beautiful Mau'i all week and we have stopped by a little farmer's market near Kihei a couple times to buy the delicious apple bananas. I bought a cheremoya the other day and it was finally ripe enough to cut into today. Delicious! I have seen these in the store in the hispanic produce section in Kansas City, Kansas but they're expensive. I will have to start buying them periodically. The closest thing we have to this in the wild is the paw paw Asimina triloba which is native to Kansas and Missouri and is similar to a banana custard when ripe. fruit in preparing a desert for the last contest. I had never heard of it before so I googled it. I will search around in Chicago for cherimoya although I am a bit scared of the seeds! anonymous-Don't be scared of the seeds. They're too big to miss and are easy to spit out. Hope you find a cherimoya. They're heavenly! I tried a cherimoya and it just tasted like a carrot! Seriously! How can it taste so different from the descriptions I've read here? Did I get a bad one? Maybe I need to try another one. anonymous- A carrot? Really?! I'm truly surprised. A cherimoya shouldn't taste anything like a carrot. Where did you get it? Susan, I got the carrot-tasting Cherimoya at H-mart (a Korean/Asian market) in Lynnwood, Washington. And it was definitely a Cherimoya - that's what it said, and it looks like the pictures I've seen. I guess I need to try another one, hopefully I'll have better luck! anonymous-Yes, please do try again. Cherimoyas are the essence of tropical fruit flavors. Let me know if you find a good one! Well I tried my second Cherimoya, and this time I let it ripen for a couple of days. It tasted better. But I could still taste the carrot flavor. Maybe I'll let the next one ripen for 3 days. Or wait until it's turned all brown! How do I know when it's at its peak ripeness? carrot guy-So bizarre that it still tastes like carrot.To test ripeness: Place it in the palm of your hand and give it a gentle squeeze. It should give slightly but not be so mushy that it squishes in your hand. Some fully ripe cherimoyas have some brown streaks on them, but completely green ones can also be ripe. So the touch test is the best. I was told (by my landlord, who picked it off his tree) that it should be as soft as a ripe banana, and that worked just right. Sooooo goooood. There's a strong pear taste, blended with a little coconut-like milk.